There are two options: install using NuGet or manually download the SDK from asprise.com. First, create a new Visual C#/Visual Basic Windows Form Application project into a solution if you don’t have an existing project. If you are using Visual Basic .NET, create a new module with a Main Sub and put the VB.NET equivalent of the above code to it. Click ‘Start’ or press F5 and you should see the the demo UI as shown below. Browse an image, optionally select an output format and click the ‘OCR’ button to perform OCR. 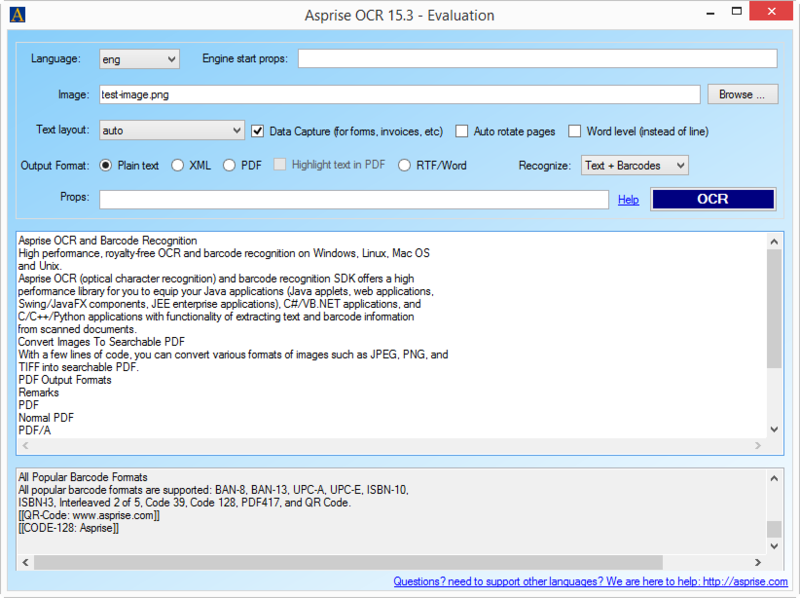 Download a copy of Asprise OCR SDK from www.asprise.com/product/ocr. Simply unzip it to an empty folder. Right click on asprise-ocr-api-sample project and “Set as StartUp Project” then hit ‘Start’ button or press F5 and you’ll see the same UI as shown in last section. Lines 4 & 5: Creates a new Ocr engine that recognizes English in fastest speed setting; The evaluation version is able to recognize English (eng), Spanish (spa), Portuguese (por), German (deu) and French (fra). For other languages, please contact us. The list of languages supported can be found Languages Supported. Line 7: All the OCR work is done here. 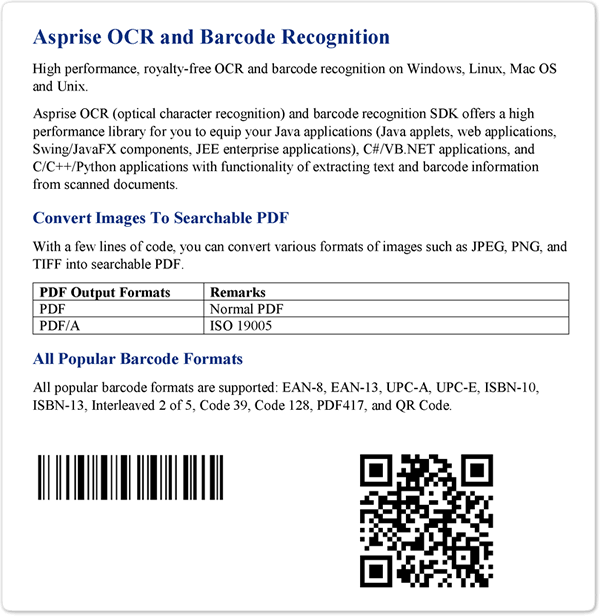 The Recognize method of the AspriseOCR class recognizes all the characters and barcodes from the image and output them as plain text. Other supported output formats are: XML (AspriseOCR.OUTPUT_FORMAT_XML), searchable PDF (Ocr.OUTPUT_FORMAT_PDF) and user editable RTF (Ocr.OUTPUT_FORMAT_RTF). 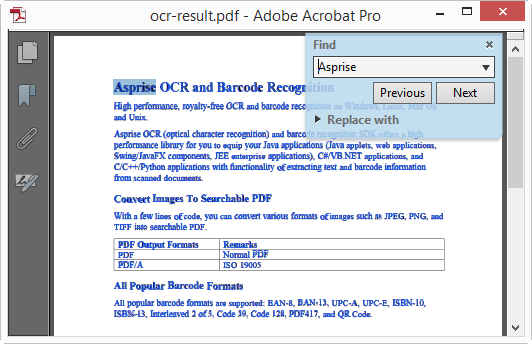 Asprise OCR supports the following image formats: GIF, PNG, JPEG, TIFF and PDF. The last two lines represents bar code information extract. Note both the format and content of the barcode are enclosed in ‘[[ ]]’ pairs. 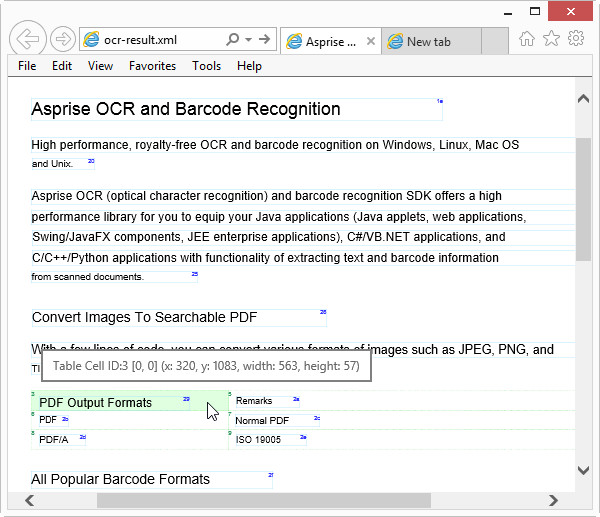 Asprise OCR XML output contains rich information like text coordinates, fonts, confidence level, barcode type, barcode locations, as well as table information (cells with location and row/column info). For the list of all supported properties, please refer to Asprise OCR Property Summary. To make the text invisible or transparent, you simply set PROP_PDF_OUTPUT_TEXT_VISIBLE to "false". Both normal PDF and PDF/A are supported. Please refer to Asprise OCR Property Summary. Set the output format as OUTPUT_FORMAT_RTF, you can then output .rtf files that can be edited in most word processors (Microsoft Word, Libre Office, TextEdit, etc.). This section covers common OCR tasks. The above code OCR the top left part of the image with width 400 pixels and height 200 pixels. Note 1 means the second page (the page number of the first page is 0). -1 means all pages. Scan at resolution DPI 300 (or 400 for small fonts). Higher DPI may not necessarily result in better accuracy but lower DPI may affect the quality. Scan in grayscale mode or color mode, but not black/white mode. Image pre-processing can be a great tool to improve OCR accuracy for special images. Image operations specified PROP_IMG_PREPROCESS_CUSTOM_CMDS are executed in a chain. You can chain many opertions in the command. The list of available operations can be found at Image Pre-processing Related Properties. 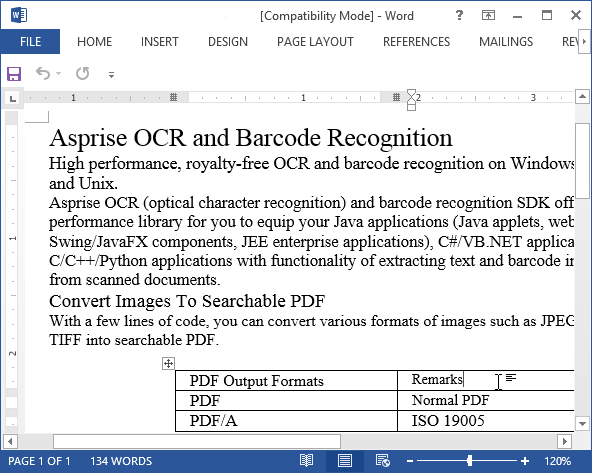 The OCR engine is optimized to recognize human readable words and there are built-in dictionaries and templates. We’ll use an example to find out roles played by dictionaries. The OCR result with the default settings will be: abcdopqr abchpqr. The OCR engine may have detected abcd0pqr but it discarded it as it is unlikely a word since there is a number between characters. Again, the correct result is returned. Most of modern computers run on multi-core CPUs. Multi-threading can significantly reduce the runtime by making full use of the processor power. It is easy to do multi-threading with Asprise OCR. You can implement thread pool pattern by yourself or you can use Microsoft’s default implementation of thread pooling. Note that each thread must have its own dedicated OCR engine instance. You need to distribute aocr.dll along with your own binary code. Dll files should be put into one of the folders in system PATH.